Courtesy of: You Gotta Eat Here! These fresh catfish po'boys are ideal comfort food for either lunch, dinner or just whenever you've got a craving! 1. In a medium bowl, combine green cabbage, red onion, red pepper, and carrot. 2. In a second bowl, stir together mayonnaise, sour cream, apple cider vinegar, and sugar; pour dressing over the cabbage mixture and toss well. 3. Cover and refrigerate for 2 hours before use. 1. To make the pickled onions, place onions into a medium bowl. 2. In a pot, combine brown sugar, kosher salt, vinegar, pickling spice, and 1/3 cup of water. 3. Bring mixture to a boil and pour hot mixture over the onions. 4. Cover bowl with plastic wrap and set aside to cool for at least 1 hour. 1. Stir together mayonnaise and Tabasco sauce; set mixture aside until assembly. 1. To fry the catfish, heat oil to 350ºF in a heavy-bottomed pot large enough to fry two catfish fillets at a time. 2. To set up dredging stations, place flour in a small bowl. 3. In a second bowl, whisk together eggs and 1 tablespoon of cold water until smooth. 4. In a third bowl, stir together panko breadcrumbs, Cajun spice, cayenne powder, parsley, garlic powder, and onion powder. 5. Dredge catfish in the reserved flour, to coat; transfer catfish to the egg wash, then flip fillets in the panko mixture, to coat. 6. Ease two catfish fillets into the hot oil to fry. 7. Fry fillets for 4 minutes until golden brown; flip and continue frying until golden brown on the second side. 8. Remove fillets from the oil and set aside to drain on a paper towel-lined plate. 9. Repeat with remaining catfish fillets. 10. 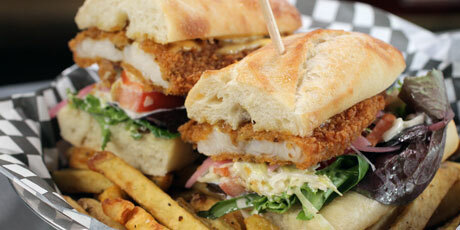 To assemble the po’ boy, slice baguettes in half and top the bottom half of the baguette with lettuce and tomato. 11. Add catfish fillet and top with reserved Pickled Red onions, Coleslaw, and Tabasco Mayonnaise. 12. Repeat assembly with remaining sandwiches. Coleslaw should be made at least 2 hours ahead of time. Pickled Red Onions should be made at least 1 hour ahead of time. Pickled Onions will keep for up to a week if covered and refrigerated. Coleslaw will keep for up to 2 days if covered and refrigerated.